Coconut oil (روغن ناریل), what we can also call as the wonder oil, offers us the best of the best benefits – most of which are unknown to a number of us. Coconut oil (also known as copra oil), is an edible oil that is extracted from the kernel of mature coconuts harvested from the coconut tree. Just like any fat, coconut oil too is a blend of fatty acids. Lauric and myristic acids are the two major fatty acids present in the oil (44 percent of lauric acid and 16.8 percent of myristic acid), which are responsible for most of the benefits the oil provides. The monoglycerides and the medium-chain fatty acids present in the coconut oil are similar to those in the milk of the mother. These acids carry extraordinary antimicrobial and anti-inflammatory properties and disrupt the lipid structure of the microbes, thereby causing their deactivation. Though coconut eliminates the negative bacteria, it does not affect the gut bacteria that is good for health. As it contains Lauric and myristic acids, Coconut oil can be used in numerous home remedies which can be beneficial for one’s health in multiple ways. Coconut oil is one of the richest sources of medium chain triglycerides (MCTs), the consumption of which can help trim excess body fat. It also has been found that consumption of oils rich in medium chain triglycerides results in a greater rate of weight loss, compared to that of oils rich in long-chain triglycerides. It has been proven that diets high in MCTs can improve glucose tolerance and also reduce the accumulation of body fat. Coconut oil also helps regulate blood sugar levels, thereby minimizing the effects of the disease. Coconut oil is high in natural saturated fats. Saturated fats not only increase the healthy cholesterol (known as HDL) in your body, but also help to convert the LDL “bad” cholesterol into good cholesterols. By Increasing the HDL’s in the body, it helps promote heart health, and lower the risk of heart disease. Coconut oil has been known to clear up and heal urinary (UTI) and kidney infections. The MCFAs in the oil work as a natural antibiotic by disrupting the lipid coating on bacteria and killing them. Also there is a study showing that coconut oil directly protected the liver from damage. Coconut oil has two qualities that help it fight cancer. One, because of the ketones produced in its digestion. Tumor cells are not able to access the energy in ketones and are glucose dependent. It is believed that a ketogenic diet could be a possible component of helping cancer patients recover. Coconut oil is wonderful as a face cleanser, moisturizer and sunscreen, but also it can treat many skin disorders. The fatty acids (Caprylic and Lauric) in coconut oil reduce inflammation internally and externally and moisturize making them a great solution for all types of skin conditions. If you have dandruff or dry hair coconut oil has the perfect fatty acids to help improve these conditions. Coconut oil may help naturally balance hormones because it’s a great source of saturated fat including lauric acid. Studies have found that coconut oil may be an excellent fat to consume during menopause and also may have positives effects on estrogen levels. 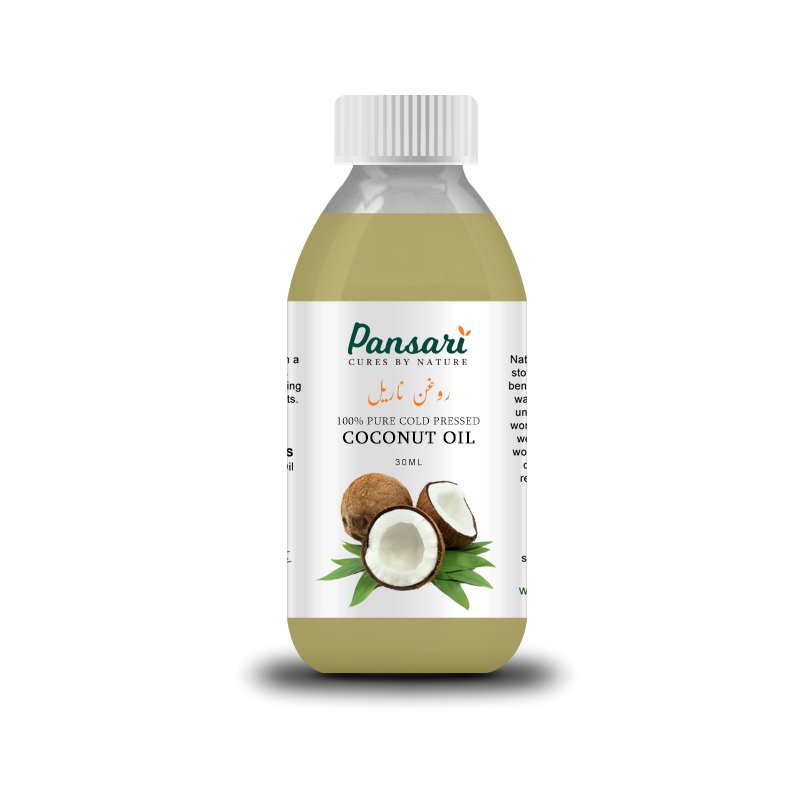 NB: Pansari's Coconut oil is pure oil and can be used for edible purposes too.